Our organization began to coalesce during the summer of 2014, with mobilization efforts in the northwest Bronx for the People’s Climate March. 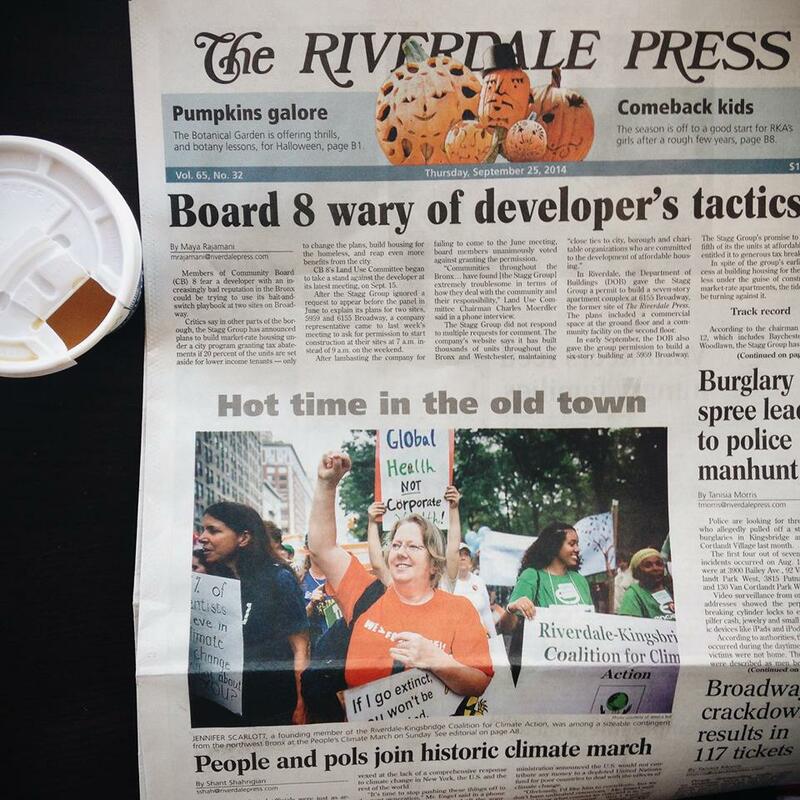 We called ourselves the Riverdale-Kingsbridge Coalition for Climate Action (RKCCA). The assistance and support of two local institutions were of particular importance – Riverdale-Yonkers Society for Ethical Culture and the Church of the Mediator, Kingsbridge. We are also very grateful to The Riverdale Press, which has covered our activities from the beginning. The People’s Climate March “Host Committee” – the many individuals and organizations who came together in the winter, spring, summer and early fall of 2014 to organize what became the half-million-strong People’s Climate March on September 21, (in the winter of 2015, the PCM Host Committee became the People’s Climate Movement NY-PCMNY) – came together in response to the announcement that UN Secretary-General Ban Ki-moon would convene a UN Climate Summit when the UN convened in September, 2014. The decision to hold a massive people’s march, calling on governments attending the summit to take immediate, urgent steps to curb climate change, included the understanding that as important as the march itself would be, even more critical would be the growth and strengthening of the civil society underlying the burgeoning global climate movement. RKCCA took this double mandate very much to heart, committing itself to turning out large numbers from the northwest Bronx at the September 21 march, and to continuing the struggle to build the movement for climate justice long after the march was over. In early October, RKCCA began a post-march series of meetings and discussions that culminated with the formal adoption of the name Bronx Climate Justice North (BCJN). The name was chosen to underline our commitment to the work and tenets of climate justice, as well as to our formal alliance with Bronx Climate Justice South, a coalition of environmental justice organizations based in the South Bronx. 11/8/14, BCJN Forum, “The Bronx is Breathing!,” with Mychal Johnson and Taleigh Smith of BCJS, Eco Anchor NYC. 12/10/14, 350NYC.org’s rally, “Climate Justice is a Human Right: Rally for a Global Climate Treaty,” Dag Hammarskjold Plaza, New York City. 2/13/15, 350NYC.org’s rally, “Global Divestment: Whose Side Are You On?,” Broad St./Exchange Place, New York City. 2/6/15, BCJN hosts film screening and discussion of “Crude: The Real Price of Oil,” about the fight against Chevron by indigenous Ecuadorians in the Amazon, Tribal Link Foundation. 5/26/15, “The Worm in the Empire Apple,” a BCJN founding member writes about the need for justice for NY State’s farmworkers. 5/1/15, BCJN is a proud supporter of South Bronx Unite and its Platform, campaign against FreshDirect, the Port Morris-Mott Haven Waterfront Plan, and the Principles for Private Development. 11/21/14, BCJN hosts film screening and discussion of “Chasing Ice,” an award-winning film about the disappearance of glaciers and ice packs, Amalgamated-Park Reservoir Co-op Bulletin. 3/20/16, “All for one and one for all: seeking resilience in the fight against climate change,” a Sunday platform at the Riverdale-Yonkers Society for Ethical Culture by BCJN members Jennifer Scarlott & Mary Hemings.